The Age Related Eye Disease Study (AREDS) was the first major National Institutes of Health study testing nutritional supplements for treatment of age-related macular degeneration (AMD). It firmly established a therapeutic rationale for treating dry macular degeneration with supplements. The new ongoing Age Related Eye Disease Study 2 (AREDS2) is the second major study being conducted by the National Institutes of Health. formulation. AREDS2 is a major study and will provide new insights into treating AMD with supplements. Since the publication of the original AREDS, there have been several studies showing lutein is helpful in macular degenerative disease. One of the latest ground breaking studies, The Veterans Lutein Antioxidant Supplementation Trial (LAST Study), showed a therapeutic benefit for lutein in all stages of dry macular degeneration. There have also been several studies showing that the omega-3 fatty acids EPA and DHA reduce the incidence and progression of age-related macular degeneration. In addition to visual health, the omega-3 fatty acids are also involved in overall health and especially cardiovascular health. The American Heart Association recommends 1,000 mg per day of the omega-3 fatty acids EPA/DHA. Many fish oil products on the market do not contain these higher concentrated levels of EPA and DHA. 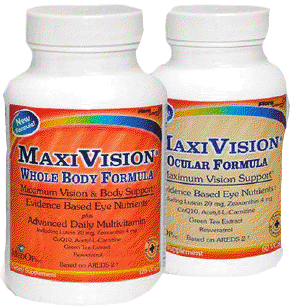 The Whole Body Formula and the Ocular Formula are the premiere supplements in the MAXIVISION® Product Line. They are the most comprehensive and progressive combination of nutrients, based on all relevant studies, providing the greatest benefit for patients. Whole Body Formula is a comprehensive multivitamin including the comprehensive evidence-based ocular nutrients. Ocular Formula is a comprehensive evidence-based ocular supplement. Recommended for patients with macular degeneration, but also useful for prevention and for patients with a family history of AMD. 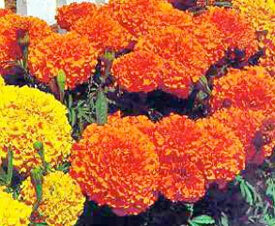 Both contain the highest amount of lutein (20 mg/dose) and zeaxanthin (4 mg/dose) of any product on the market. Both also contain CoQ10, Acetyl-L-Carnitine, Resveratrol, Boswellin PS, Green Tea Extract, Vitamin D3, Taurine and several others. Maximun treatment for age-related macular degeneration requires eating a healthy diet, an exercise program, no smoking and nutritional supplements. The most advantageous supplement protocol would include the components used in the AREDS, the AREDS2 and all other relevant studies. There are several levels of products on the market specifically targeting ocular health. 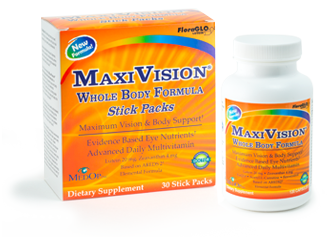 MAXIVISION® is a product line commonly recommended by leading doctors across the country. MAXIVISION® products are based on all current research and formulated by an Advisory Board composed of leading doctors and researchers. By combining important information from all relevant studies, MAXIVISION® provides the most advanced, progressive protocols available for maintaining overall health and maximizing visual function. The most advanced therapeutic protocol for AMD includes a product like MAXIVISION® Whole Body Formula or Ocular Formula for the powdered nutrients plus MAXIVISION® Omega-3 Formula for the oily omega-3 fatty acids EPA and DHA. The combination of these products creates a synergistic effect providing the most comprehensive nutritional support for vision and overall health. 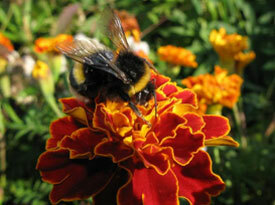 The Omega-3 Formula contains 1,000 mg of the fatty acids EPA and DHA per dose. The fish oil is encapsulated in enteric coated softgels which eliminate the annoying fish burp, fish taste or gastrointestinal distress often encountered with other fish oil capsules.